In spite of a huge increase in air travel with the arrival of low cost carriers, there is still high demand for travelling with a vehicle, be that a car, motorhome, motorbike or truck. The only way of doing this is to travel by a specialist ship, designed to carry both passengers and vehicles. Often referred to as ro-pax ships, these dual-purpose ships straddle both the freight and passenger sectors. 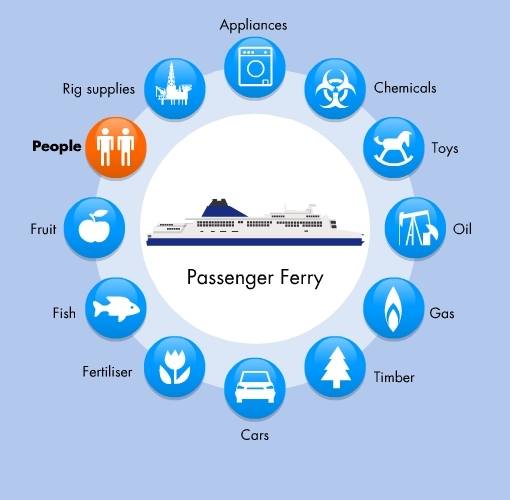 Combining the cargo capacity of roll on-roll off ships with the passenger facilities of modern ferries makes these ships versatile and better able to cope with the annual travelling peaks and troughs on many passenger routes. The ships are usually laid out over two or three decks with entrance and exit access on built-in ramps through very wide stern doors. By their very design, Ro-Pax ships are designed to provide maximum efficiency in loading and offloading of cars/cargo and passengers, and are equipped to handle various shapes and sizes of freight.